Antigone was the daughter of Oedipus and his mother Jocasta; her story has come down to us principally through Sophocles’ tragedy of the same name. Sophocles wrote his work as a reaction to the banning from Athens of Themistocles, the hero of the naval battle of Salamis. Here Sophocles dealt with the question of morally justified opposition to the power of tyranny. Hegel once praised Sophocles’ Antigone as the most perfect work of art known to him. In 1841 Mendelssohn, as newly appointed master of royal music, was commissioned by King Friedrich Wilhelm IV of Prussia to compose incidental music for the play. It was first heard at a performance given at the King’s private theatre, in a German translation by Johann Jakob Christian Donner which retained the verse forms of antiquity. Published in 1838/39, it soon become the most popular German version of the play. Contrary to the normal customs regarding incidental music at that time the choruses of the ancient tragedy, with an overture to precede the play. 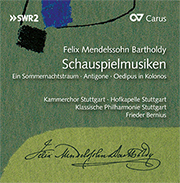 For this recording the spoken text has been written by Helmuth Flashar. 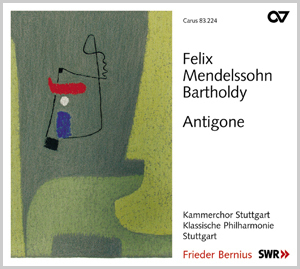 Frieder Bernius has recorded this little-known music of Mendelssohn with the Klassische Philharmonie Stuttgart and the men’s voices of the Kammerchor Stuttgart. Niemand scheint momentan kompetenter in Sachen Mendelssohn zu sein als Frieder Bernius, ... Die diffizilen Oden gestalten die Mendelssohn-erprobten Sänger kraftvoll, vorbildlich transparent und mit Sinn für dramatische Verdichtungen, ohne der introvertierten Musik äußere Effekte abzuzwingen.